Lao residents with vehicles who intend to travel to Thailand will not be able to cross with ease as restrictions have been placed on all border checkpoints after the Thai military staged a coup to seize power and maintain peace and order on May 22. 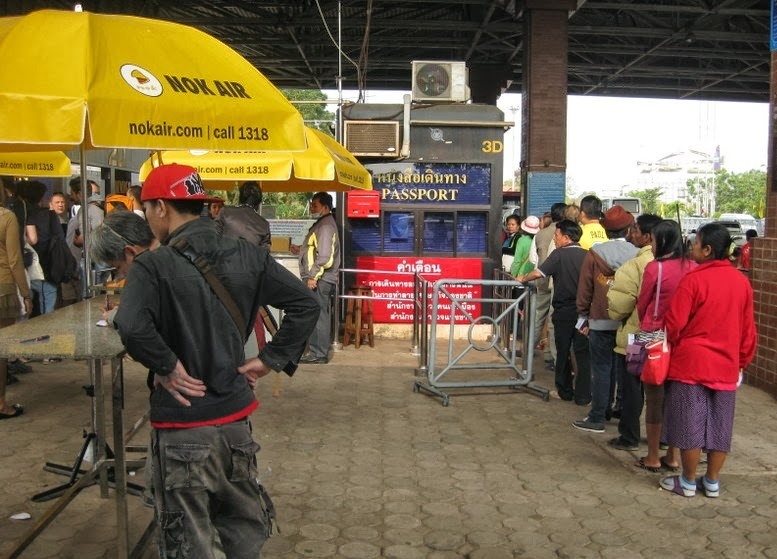 Lao people who carry border passes are currently restricted from using them to enter Thailand. Thai military officials have advised residents to use a passport and only go into Thailand if it is a necessity. According to an interview with the Consular Department of Laos, the department had received information from Thai authorities at the border checkpoints on Thursday which instructed locals to refrain from crossing the border unless it was absolutely necessary. If locals cross the border they must use a passport as border passes are now restricted. from Thai authorities on Thursday who have said people travelling into Thailand to visit may have problems crossing the Thai checkpoint.” Mr Somboun said the border was used to facilitate locals crossing between Laos and the Thai provinces of Nong Khai and Oudon Thani. The bridge remains open as normal from early morning to late evening but restrictions apply on the Thai side, he said. “Locals who have urgent business in Thailand such as medical appointments or hospital visits, will be allowed to cross the border,” he said. Mr Somboun said on average more than 100,000 tourists cross the border every month while there were 684,000 vehicles, including cars and trucks, which crossed the bridge last year. Customs officers and policeman at the friendship bridge told Vientiane Times yesterday that Lao people and vehicles were refused entry at the Nong Khai checkpoint after the military restrictions began on Thursday. 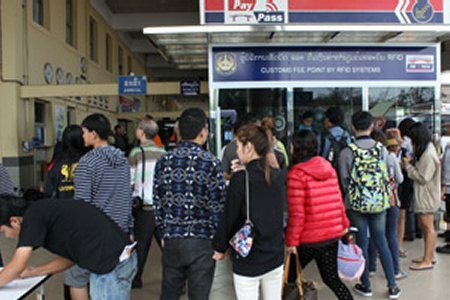 “Lao immigration is not restricting people from going to Thailand however, restrictions may apply once you reach the Thai checkpoint in Nong Khai.” A Thai national, who is a member of a study tour group from Ayutthaya University, said his group of 80 people entered Laos to participate in a study tour of the National University of Laos. “Before we were allowed to enter Laos, the Thai authorities from Oudon Thani province asked us for our documents and this was the only reason we were allowed to enter Laos,” he said. According to a news report from The Nation’s website in Thailand, Army Chief General Prayuth Chan-Ocha staged a coup on May 22 to seize power after both parties failed to reach a compromise and end the six month-long political crisis. Two days after the declaration of martial law, both parties attended two meetings before General Prayuth ordered the detention of 30 representatives and seized power. Prayuth announced via television, “In order for the country to return back to normal, the National Peacekeeping Committee comprising the armed Forces and the police, need to seize power as of May 22 at 4.30pm.” On Tuesday, the military shut down 14 cable and satellite television stations, including Voice TV. They are now under the control of military groups and stationed personnel in the country’s main television stations are enforcing the censorship of news. ???????????????????????? ???????????????? ????????????????????????????? (???) ?????????? 22 ??????? 2014, ????????? ????????????????????????? ??? ??? ??????????????????????????????????? ???????????????????????????????????????????????????????????????? ?, ????????????????????????????????????????????????????????????????????????????????????????????????? ???? ?????????????????????????????????????????????????? ???????????????????????????????????????????????????? ??????????????????????????????????? ???? ?????????????????????????????????????????????????? ??? ???????????????????????????? ??????????????????????????????????????????????????????????????? ???? ?????????????????????????????????????????????????? : (+662) 5396667; (+6643) 393402.